Imagine a situation where you are away from your PC and are traveling. And at the moment you are waiting for an important email that needs to be answered promptly and whatever you have is your mobile phone. Instead of continuously checking your inbox at such times, you can set an SMS alert that notifies you of receiving email. I'm sure many of us need this SMS Alert feature. All you have to do is go to the Chrome Web Store and install the Gmail SMS Alerts extension. Once you've installed your Chrome extension, log in to your Gmail account. At the top right of the screen, you will see a new "SMS" button, click on it. A new pop-up window will open. Click on the "Create Account" button here. Then follow the on-screen prompts. Here you will need some permissions for this extension. Now click on the "SMS" button again to enter your phone number. Once you type your phone number, just click on the blue button below "Send me confirmation SMS". You will then receive an SMS confirmation code on this number. Enter this number, then click Confirm. 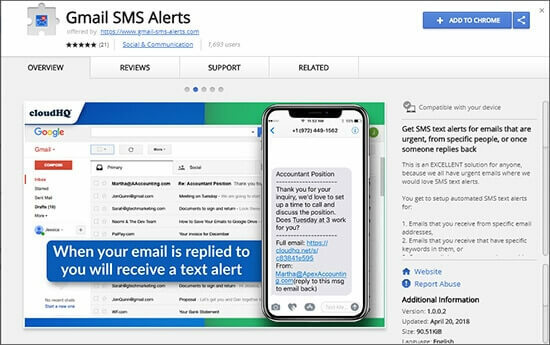 Now you can create your own rule to add the address of the emails you want to receive SMS text alerts. A pop-up window will open when clicking on the top right of the SMS icon in the Gmail window. Click on the "Add New Rule" button here. Then a pop-up box will open, in which you can add the email address for which you want to receive SMS notifications. If you do not know the email address, you can add the keyword of a subject of this email in the subject with the subject below. Now click on the "Save Rule" button at the end. You will now see that your rules are ENABLED, and your rules will start immediately. All information received in your Gmail account will be viewable in your text messages. This is great when you have limited internet connectivity and you want to see some emails instantly as a text message on your mobile phone. Gmail SMS Alerts are great for everyone, who want to manage important email quickly and easily.